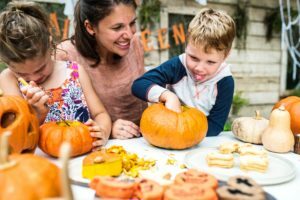 If you’re looking for some fun Halloween-themed activity ideas to keep the kids (and you) entertained at home we’ve got you covered. Now, who fancies a game of Zombie Wink Murder? Pumpkin-canos are about to become the next big thing… or at least they should. This one makes a bit of a mess so you’ll need to put your carved pumpkin onto a tray or take it outside. By adding a few simple ingredients (bicarbonate of soda, vinegar, food colouring and, to ensure lots of foam, some washing-up liquid) you can turn your pumpkin into a fun science experiment. Find the details and the information on the science behind it here. If you need some ideas on where to pick your own pumpkins take a look at our October half term page. Red Ted Art have some brilliant ideas to create some simple, beginner origami monster (and owl) bookmarks, perfect for encouraging kids to grab a book and read! This really simple idea from Housing a Forest is a perfect sensory activity for the little ones and a fun creative craft for the older ones. Cut them out and hang up in the house when you’re done as Halloween decorations. If you haven’t already joined in the rock painting and hunting craze, Halloween provides lots of inspiration on how to decorate your rocks, from ghosts to witches find out how you can join in with your local group here. Need a break from the Halloween crafts? Fancy sitting down with a cuppa instead? If you’ve got little ones who aren’t ready for scary Halloween films yet this site makes some recommendations of films you can watch together with some suggestions for those a little older too. A favourite in our house is Wallace and Gromit: Curse of the Were-Rabbit. The BBC Good Food website has a great basic playdough recipe and it’s easy to make it a fun extra-sensory activity by adding some Autumn smells to it. Choose orange as the colour and add some cinnamon, nutmeg and ginger ground spices to the mixture. Smells amazing! Easy to make and you’ll have what you need lying around. This blog suggests sticking on googly eyes but you can always draw some on. 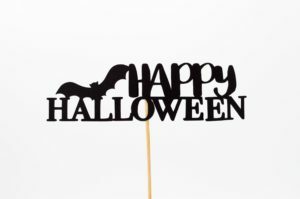 Olive magazine seem to have found a good balance here with some easy spooky cake ideas for the kids and some Halloween-inspired cocktail recipes for the adults! Well if you’ve got cocktails it seems a shame not to have a party. If you want some Halloween games to play at the party or before you go out trick or treating (like they won’t already be wound up enough as it is) then take a look here for some fun ideas such as Wink Murder Zombies – which is less terrifying and more kid-friendly than it sounds.